Above is the question the posters asked, we now have the answer. 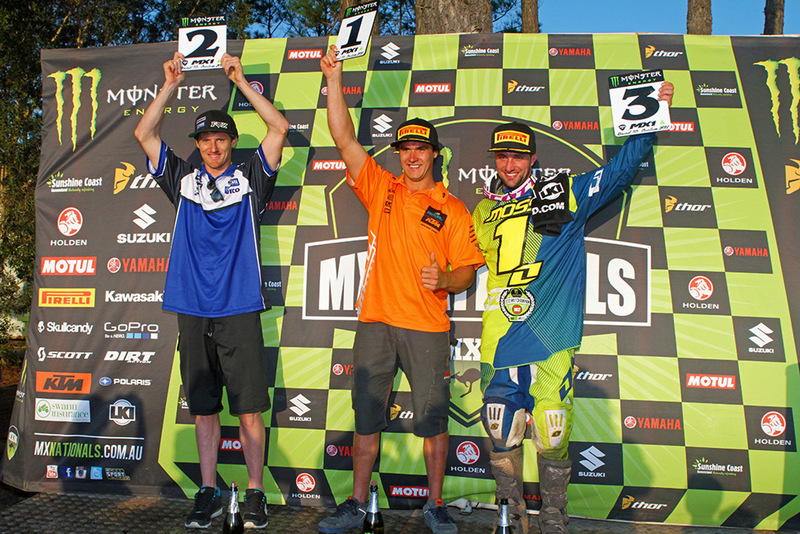 Team Motul Pirelli Suzuki’s Matt Moss has been crowned the 2013 Monster Energy MX Nationals, Australian Motocross Championship, MX1 champion after finishing third overall at today’s season finale in Coolum. Click here for race highlights. The 25-year-old added the MX1 crown to his 2009 and 2011 MX2 titles, winning the first 30-minute moto at Coolum before sealing the title with a calculated ninth in moto two. It was Suzuki’s first title since Daryl Hurley won in 2005, a fitting result upon Moss’ return to Australia with the Motul Pirelli Suzuki outfit. “I feel really good,” said Moss. “I’d just like to thank Motul Pirelli Suzuki, Jay Foreman, and the Foreman family. It’s such a loving family and we get on so good. Winner of Coolum was Motocross World Championship-bound Todd Waters (Motorex KTM), taking out the GoPro Super Pole and then racing to 3-1 results for the overall. 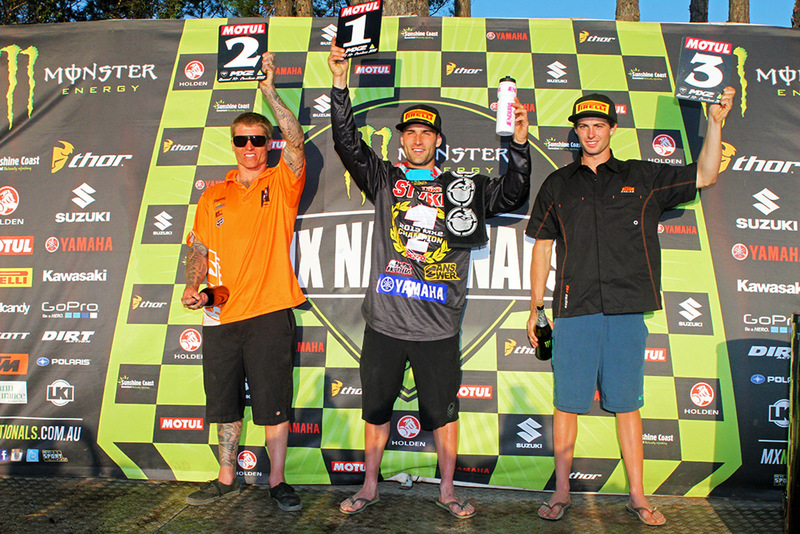 Billy Mackenzie, Todd Waters and Matt Moss were top three at Coolum. Image: Simon Makker/Makkreative.com. Waters was gracious in defeat, finishing runner-up for the second season in a row with a 16-point defecit to Moss following a hard-fought season. “We did everything we could and I’m proud of this championship,” said Waters. “We started off strong, and had a few mishaps, so to be on the box still with a broken collarbone and a few other injuries, I’m proud of. Rounding out the podium was CDR Yamaha’s Billy Mackenzie, racing to a pair of seconds during the motos. He led much of moto two, but a crash mid-moto forced him to settle for second. Mackenzie wrapped up third overall in the championship, with his lone victory of 2013 coming at Hervey Bay’s seventh round. “It’s been a solid season, but not solid enough, I’ve finished second and third way too many times this year,” said Mackenzie. “I would have liked more wins, we’ve been building on it all year and CDR Yamaha have really helped me. 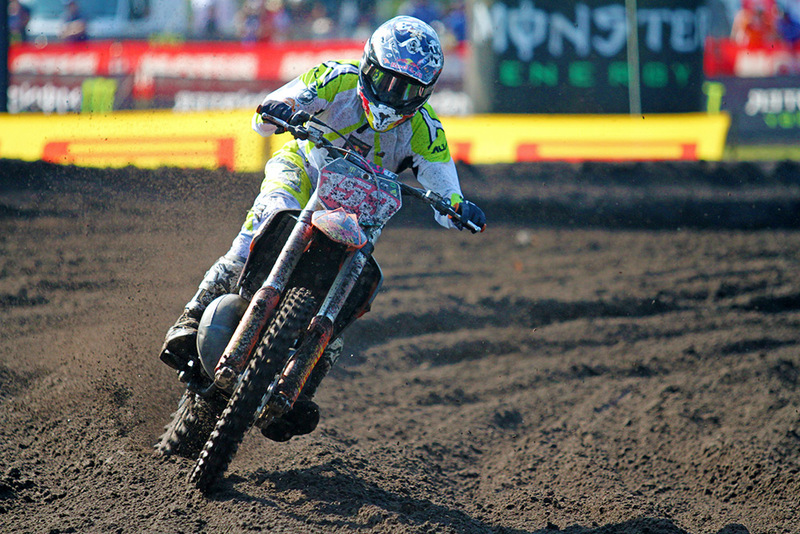 Matt Moss is your 2013 Monster Energy MX Nationals MX1 Champion. Image: Simon Makker/Makkreative.com. “The bike was awesome and everything about the team was just super-professional. Any little modification we needed or had to do was done straight away. Moss’ teammate Cody Cooper put forward a consistent effort in fourth with a 5-3 scorecard, beating home Waters’ teammate Kirk Gibbs. Gibbs was eighth in moto one despite a heavy early fall, but rode to fourth in the second moto. Sand specialist Gareth Swanepoel (Carlton Dry Honda, 4-6) was sixth, as Adam Monea (Monster Energy Kawasaki, 6-5), Jake Moss (Campbell Mining Suzuki, 7-7), Jay Marmont (Monster Energy Kawasaki, 9-8) and Sam Martin (DPH Suzuki, 11-10) rounded out the top 10. In the Motul MX2 ranks it was Luke Styke who again confirmed his form as Australian champion, the newly-crowned title winner going 1-1 for his ninth overall of the season. “All the hard work has paid off,” said Styke. “It was a tough track today, definitely the roughest I’ve ever ridden, and the new layout was awesome. 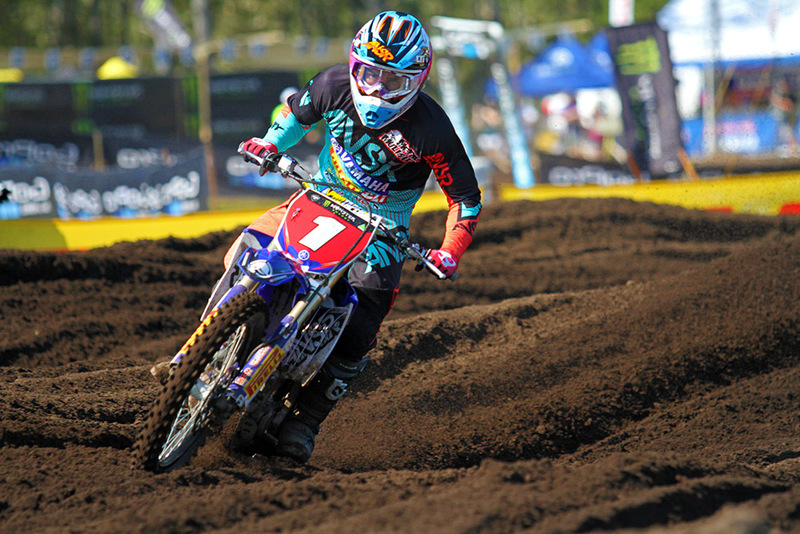 Todd Waters took the round win at Coolum and claimed second for the series. Image: Simon Makker/Makkreative.com. Second overall was Sunshine Coast local Brock Winston (Choice Motorsports KTM) with 2-2 finishes, however he led much of the opening moto before Styke struck in the closing laps. That result cemented him third overall for the season, one of the year’s revelations in his full time return to the sport. “Luke [Styke] got me there at the end of that first moto, I had the crowd there for me and cheering, I put in as much as I could but he had a bit more at the end,” said Winston. “I’m still happy, I’ve never even led a lap of a national so I’m pretty happy to do that today. Completing Coolum’s MX2 podium was rookie wonder Kale Makeham (Tune Tech Racing KTM), making it six straight podiums to close the season on his way to runner-up in the title race behind Styke. Brock Winston, Luke Styke and Kale Makeham atop the MX2 podium. Image: Simon Makker/Makkreative.com. Makeham rebounded from a frustrating fall in moto one to end up third, and he replicated that result in the second outing of the weekend. “I had a really disappointing round at Broadford, I think I went 22-10,” said Makeham. “Ever since then it has been my mission to learn from that and finish on the podium at every round, and I’m so happy to have done that. “It shows I’ve matured, which is what this year was for, it was a learning year. It’s been awesome, honestly in myself I didn’t expect to finish runner-up in this championship. Fourth for the round was Kiwi Rhys Carter (Suzuki) with fourth in both motos, while young Victorian Dylan Long (KTM) raced to fifth via 6-5 results. Privateer Beau Ralston was a solid sixth, riding his YZ250 to fifth in moto one, before borrowing Luke Clout’s factory Serco Yamaha YZ250F for the second and impressing on his way to sixth. Luke Styke capped off his title-winning season in style at Coolum. Image: Simon Makker/Makkreative.com. Positions seven through 10 were filled by Ryan Marmont (Raceline Pirelli Suzuki, 7-7), Kayne Lamont (Choice Motorsports KTM, 8-9), Kieran Scheele (Honda, 10-10) and Peter Boyle (Carlton Dry Honda, 9-11). CMR Red Bull KTM rider Hamish Harwood made it the second year in succession that a New Zealand rising star won the Pirelli MXD title, following in the footsteps of Lamont 12 months ago. Harwood clinched the title with third in moto one aboard his 250 SX, before winning moto two in style to conclude his Under 19s campaign. Winning overall at Coolum was series runner-up Jay Wilson (GYTR Yamaha), claiming the first moto victory before finishing behind Harwood in the second. “We put a lot of hard work in, but the first half of the season didn’t go to plan for whatever reason,” Wilson said. “I can’t give it up enough for everybody who stuck behind me the whole time. 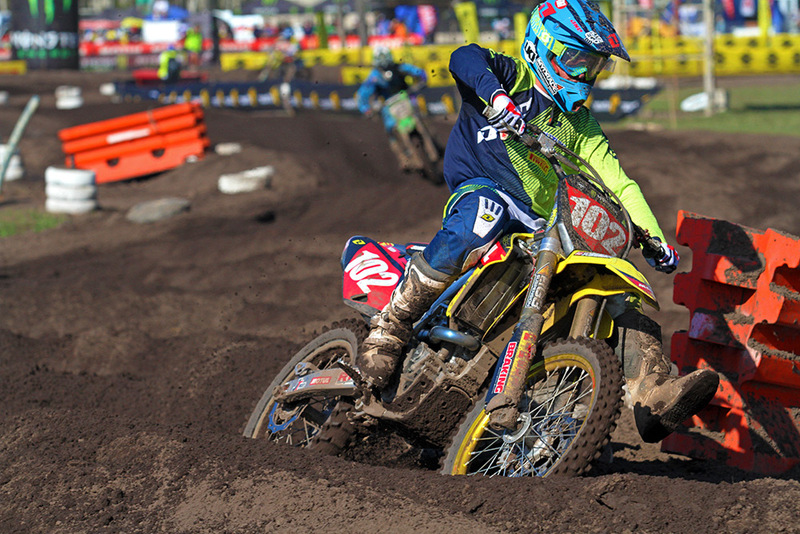 Hamish Harwood wrapped up an impressive Pirelli MXD title at Coolum Image: Simon Makker/Makkreative.com. 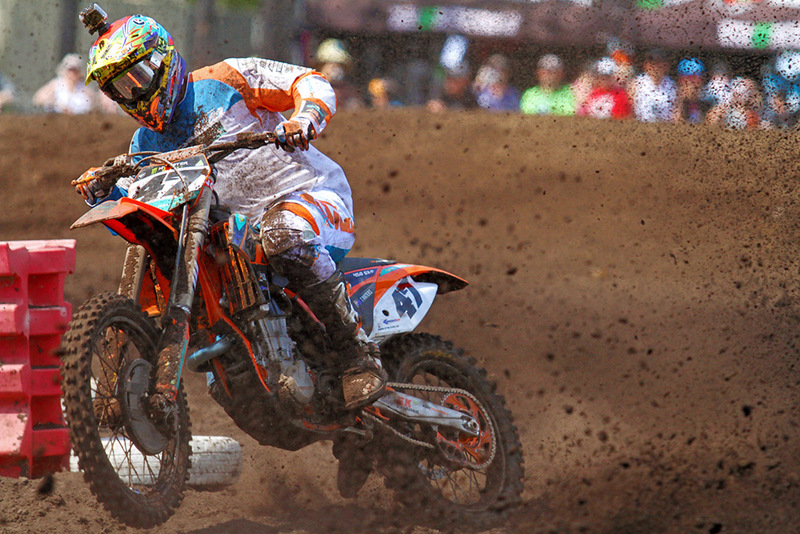 A new face stood upon the podium in MXD at Coolum, Caleb Ward (KTM), who made his return from injury at Toowoomba and then rode to third today with 2-3 performances. The top five overall for the season final at Coolum was filled by Kyle Webster (Yamaha, 4-5) and Joel Wightman (Yamaha, 7-4). Coolum’s KTM 2-Stroke Cup round was won by TM Racing Australia’s new signing Nick Sutherland, while former MXD title winner Errol Willis (Yamaha) wrapped up the title with second overall. Second in the series belonged to Tyson Cherry (Yamaha), with Ryan Perry (Yamaha) third. In the Veterans 30-39 Years it was Cheyne Boyd (Berry Sweet/Lucas Oil Yamaha) who swept the round and took his maiden national title from Cameron Taylor (Yamaha) and Travis Regeling (Honda). The Veterans 40 years title was captured by Mark Oberthur (Suzuki) ahead of Paul Novak (KTM) and Clint Andrewartha (Suzuki). Today’s round was topped by Oberthur over Novek and Mitch Rowe (KTM).